In what’s being billed as the biggest underground digital out-of-home network to date, CBS Outdoor and Turner Broadcasting System have teamed up to bring a little dazzle to the New York City subway system. Under its recently launched Ignite: Innovations Lab initiative, CBS Outdoor has installed 10 big video screens in some of Manhattan’s busiest commuter hubs, including the Metropolitan Transportation Authority stations at Times Square, Herald Square and Columbus Circle. Standing 66 inches, or five-and-a-half feet high, and about three-feet wide, the new video installations have been deployed ahead of CBS and Turner’s joint March Madness coverage. While Turner will use the screens to promote the NCAA Division I Men’s Basketball Championship, it will also stream promos for its entertainment and news programming on TNT, TBS, truTV, Adult Swim and CNN. While the screens have been set up to maximize impressions in advance of March Madness, the deal will keep the units lit through at least March 2015. According to Dennis Camlek, svp, Turner Media Group, the subway screen loops are about five minutes in duration, and all content is fed to the displays from the Atlanta campus. Camlek said that content can be swapped out practically in real time, with a lag of 30 seconds at the most. 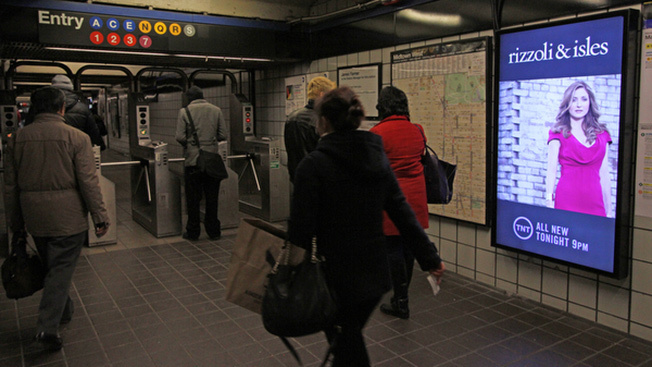 Camlek added that while the 10 screens will be seen by a great number of TV viewers—approximately 7 million commuters walk through the NYC subway turnstiles every day—the number of media buyers and other agency personnel that will pass the displays is a nice bonus. At present, Turner is using the screens to promote the hoops tourney as well as the new CNN docuseries Chicagoland and the TNT dramas Rizzoli & Isles and Dallas. According to CBS Outdoor CMO Jodi Senese, the duration between conception and deployment was about six months. If the all-Manhattan deployment may seem a tiny bit myopic—after all, there are millions of relevant targets in Brooklyn and Queens—Camlek said the Manhattan launch is just the beginning. “Our goal is to definitely expand the network going into 2015 and beyond,” he said. MediaVest, a unit of Publicis Groupe, is the agency behind the effort. This is only the latest in a series of firsts for Turner, which in fall 2010 installed video screens in the S trains running between New York's Times Square and Grand Central Terminal to promote the MLB Playoffs on TBS. March Madness tips off Tuesday, March 18, on truTV.